Can you believe that we are a mere ten days away from Christmas? I really can’t. We have been doing lots of Christmasy things so we have been in the spirit full-swing, but it still just doesn’t seem possible that it’s almost here. Even more baffling is the fact that we are about to start a new year, 2018. Weren’t we all just freaking out over Y2K, like, yesterday? How was that 18 years ago?! Anyway, I have some faves coming at you on this lovely Friday, and here they are! I’ve mentioned several times on the blog that my girlfriends and I have been doing a Dirty Santa style scarf and ornament exchange every Christmas for the last decade or so. It’s always one of my favorite evenings of the whole year because we always have such a great time. Our exchange for 2017 is now in the books as we had it Tuesday night. For the last couple of years our group has been smaller because a lot of our friends have moved away, so instead of having a big party at someone’s house, we have been going out to dinner instead. This year was no exception and we decided to continue our tradition of having it at Bonefish like we have for the last two years. After drinks we did our ornament exchange and I ended up with the cutest ornament that holds two pictures of us girls from previous Christmas parties. After the ornament exchange it was time for another round of drinks and then we did our scarf exchange. I ended up getting #1 for that exchange so I had my pick at the very end of whatever I wanted, and I ended up choosing the plaid blanket scarf that Adrienne had brought. So cute! She ended up with the scarf that I had brought as well! The rest of the evening was spent eating and chatting and it was such a wonderful three hours with some of my favorite ladies. Quality time with them is always so good for my soul and I’m so thankful to have each of them in my life! T W O – Ugly Sweater… Dresses!! This year Walmart decided to take the ugly sweater trend up a notch and they now have… ugly sweater dresses!!!! Sweater dresses have always been my very favorite thing to wear to work during the cold months so I pretty much knew that I had to have one of these. My mom had asked all of us to get ugly sweaters for something that she has in the works, so I was so excited to have an excuse to get this one! It fits true to size (I’m a small 4-6) and it is currently on clearance at Walmart.com so if you need one, that is the way to go! I saw this OPI Snow Glad IMet You polish at Marshall’s a while back and it was on clearance so I picked it up on a whim. I am so glad that I did because it has turned out to be one of my favorite polish colors ever! I love it because it’s glossy, not matte like most other white polishes, and it’s also really shimmery. It’s perfect for this time of year because it looks wintery and snowy, and it also matches pretty much everything. As I said earlier, I had lunch and dinner with lots of friends and old coworkers this week and that is definitely one of my favorites for the week! Monday I went to lunch with a guy who I’ve been close to since the very first day I started working there 13 years ago, Tuesday I had lunch with the girl who sat in the cube next to me for the last six years, Wednesday I had a gym date with another one of my favorite guy coworkers, Thursday I had lunch with two of my girlfriends, and today I’m having lunch with my old boss. I also went up to work to see everyone on Thursday since there are a lot of them that I haven’t seen since I resigned. It’s been almost a whole month since I left, so I stopped by to say hello and pass out Christmas cards. It was really great to see everyone, especially right before Christmas. I’ve missed them terribly this last month. Olivia had her class party Thursday morning. I made the cutest little snack for the party that I’ll be sharing on Tuesday! Her class did a quick skit about the birth of Jesus, and then they decorated cookies. After decorating cookies it was time to open the gifts for the class, and then they had their snacks. I love getting to spend time with my girl when she’s at school! Another favorite from this week has been all of the Christmas cards that have been rolling in!! We have received so many this week and it makes my heart happy every time I open the mailbox and see them all stuffed inside. My favorite from this week was the card that my cousin sent from college. She is currently at UGA and she and her sorority sisters all sent out a card together. Seriously, how cute is this? So my BFF and I have been exchanging gifts with each other every single year since we were like 11 and 12 maybe? Basically forever. We are now in our mid-thirties and we still give each other a little something every single year. Well, can we just take a minute to see just how well she knows me? I mean, HOW CUTE IS THIS TOTE?! If that doesn’t describe my faves in a nutshell then I don’t know what does! Did you catch my Christmas home tour earlier this week? It’s always one of my favorite posts of the whole year, and I think that this one was my favorite ever because I got to decorate the bar cart! If you missed it, you can see it here! I know I said it on instagram, but that bag is so you! I love how you have been getting to see everyone from work - I know how much you miss them! Have a wonderful weekend! What an awesome round up of favorites today!! That bag from your BFF is so perfect for you! The scarf/ornament exchange sounds so so fun and how cute is Olivia!?! I am all about your festive bar cart and cannot wait to get one for the new house!! Your sweater dress is the cutest and what a great idea to hunt one down at Was-Mart! happy Friday festive babe! I can't wait to see more of your new house!! EEK! So exciting! Sounds like a great week with friends! Love the scarf and ornament exchanged idea! What an awesome idea (the exchange) super fun!!! OMG....I've been dying for one of those totes!! But I can't decide the 4 words for it hahaha. I also love that your sweet cousin sent that card. It's never too early to start the card tradition...it's my fave. Happy Friday! Hope you have a super weekend. So much fun in this post! I love all the festiveness. We are having a mug exchange with girlfriends this Tuesday and I am so eager. I think it will be such a fun exchange. Each mug is packed full of extra goodies too! Where do I even begin!? I can't believe we are 10 days away...wow! Thanks for reminding me, I still have TONS of shopping left to do. Yikes! That "ugly" dress is cute! I love how happy Olivia looks at her party, so sweet! And your bar cart -- OBSESSED! So much Christmas goodness on here. I love it. I think that ugly Christmas dress is awesome! I hope you have a great weekend! I cannot believe Christmas is so close! It almost makes me sad because I'm not ready for the Christmas festivites to end! I'm wearing a color very similar right now the OPI one you posted and it's so pretty. Also, that Christmas sweater reminds me of the work uniform Jovie wore in Elf! Haha. Girl, that is SO true! She totally wears a dress that's almost identical!! So funny! Look at you with 9 favorites this week! Love it! 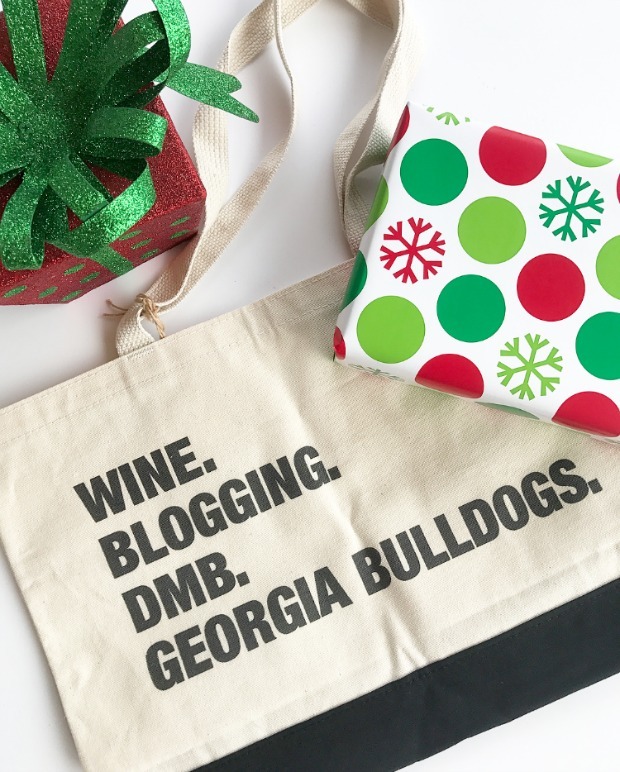 I love that tote and that ugly Christmas dress sweater. Target has a few really cute ones, as well! and that cosmo looks to die for! So much fun to have a scarf swap. I did a favorite things party with my church friends last night and it was so much fun. That sweater dress is hilarious. I can't wait to hear all about what is in the works. Hope you had a great weekend. A scarf exchange is such a great idea! I'll remember that for next Christmas! We've been doing it for ten years and we always love it! You can never have too many scarves!